Note: Schedule your exam at least 3 days ahead to avoid late fees. If you schedule your ProctorU exam within 72 hours you will be charged a $5 fee and if you schedule within 1 hour you will be charged $8.75. Click to expand and collapse the steps below. 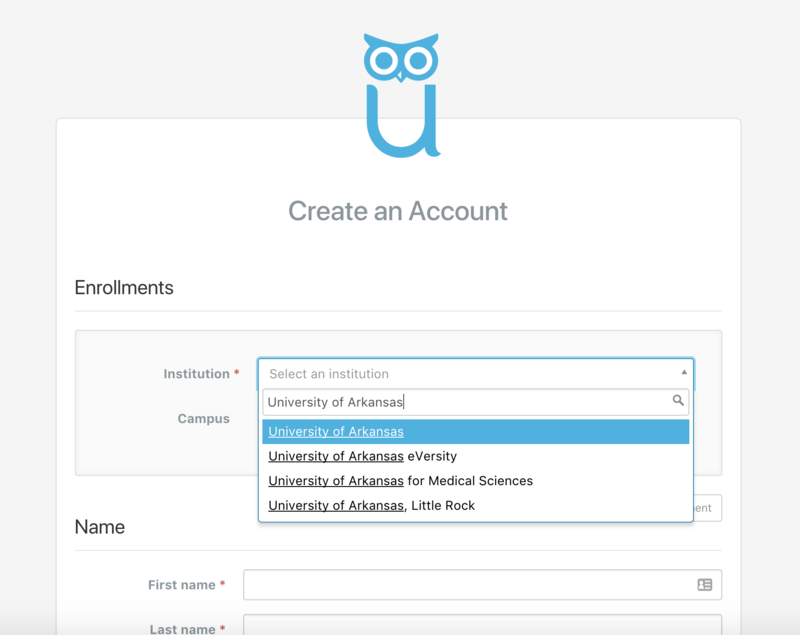 Navigate to the ProctorU Account creation page. Click Test-taker to create an account and complete your profile. 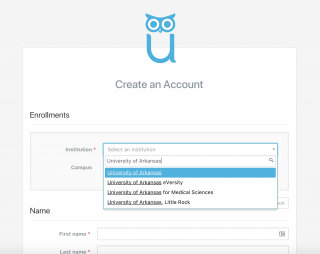 Select “University of Arkansas” as the Institution Enrollment. Your profile includes basic contact information and institution enrollment. At the bottom of the page, read and agree to ProctorU’s Terms of Service by clicking the check box to complete the profile. Sign in with your account at go.proctoru.com and select Schedule New Exam. D When finished, select Find Session. C Click to Find Available Times. D Several appointment options will appear on the right; including a Best Match. Select SELECT next to the appointment you want to schedule. You will spend at least 15 minutes doing pre exam procedure like ID checks, environment checks, authentication quizzes when your appointment starts. So you will not start your exam until 15 minutes after your appointment start time. Don’t schedule other personal appointments immediately after your exam. 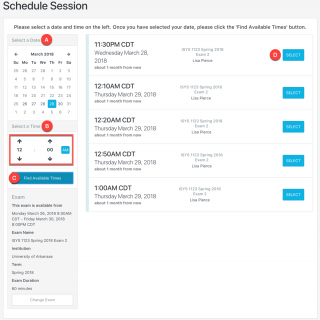 Select Schedule to confirm your session appointment. Note: If you schedule your ProctorU exam within 72 hours you will be charged a $5 fee and if you schedule within 1 hour you will be charged $8.75. This payment will be made when you go through the checkout process on the ProctorU website. Payment can be made by credit or debit card. You will now see your proctored exam session in your account. 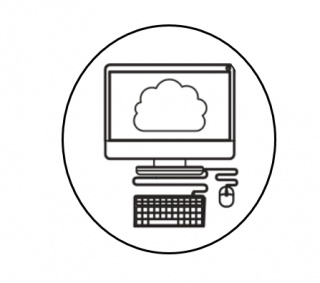 Do You Need Equipment for Online Exam Proctoring? If you are on the University of Arkansas campus and need to check out a laptop with an integrated webcam, you can do so at the Student Technology Center in the Union. They have a large number of laptops available. Go to the “Reserve IT Website” link below, log in and reserve your equipment. If possible, use a ethernet cable connection for your exam session. Wireless (“WiFi”) works, but is not as reliable as using an internet cable. 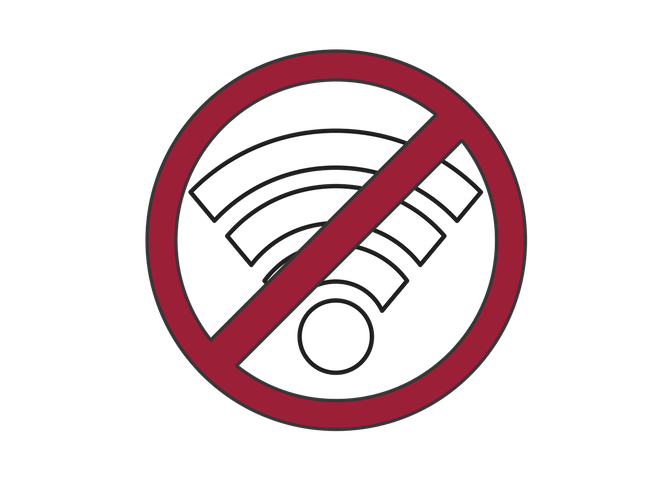 If you are on campus and have to use wireless, use the UARK Wi-Fi connection instead of UARK Guest Wi-Fi. ProctorU connection will not work with the UARK Guest Wi-Fi network. Be prepared to spend at least 15 minutes for pre-exam procedure. You will have to do an authentication quiz and environment checks during this time. These tests are done to make sure you’re in a secure testing environment. View the Taking your Exam instructions to get an idea of how ProctorU works and what to expect during your exam. You can get technical support directly from ProctorU technicians by going to: ProctorU Premium Support Open 24 hours a day, 7 days a week.